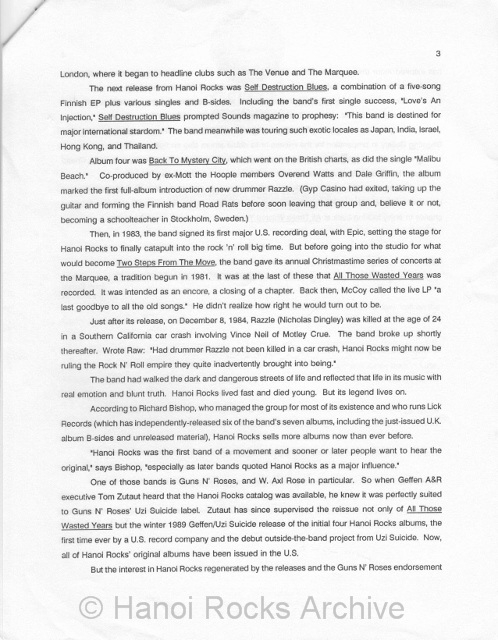 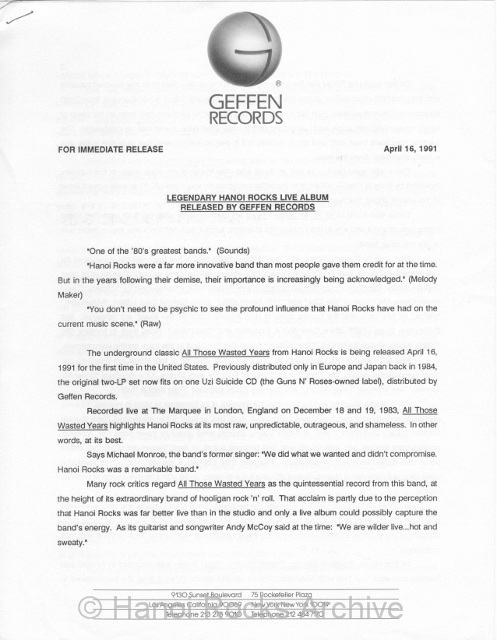 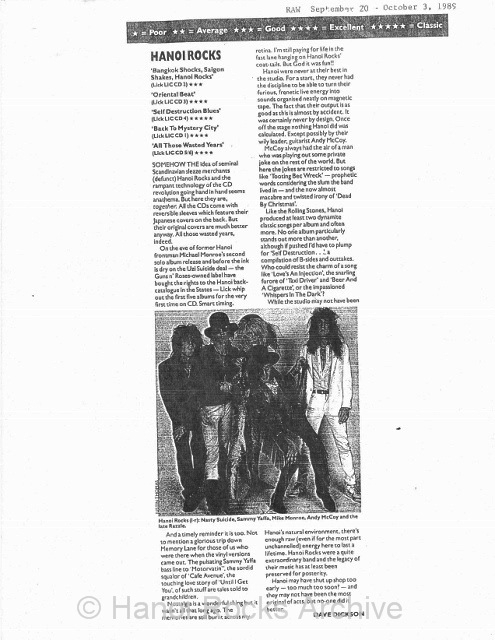 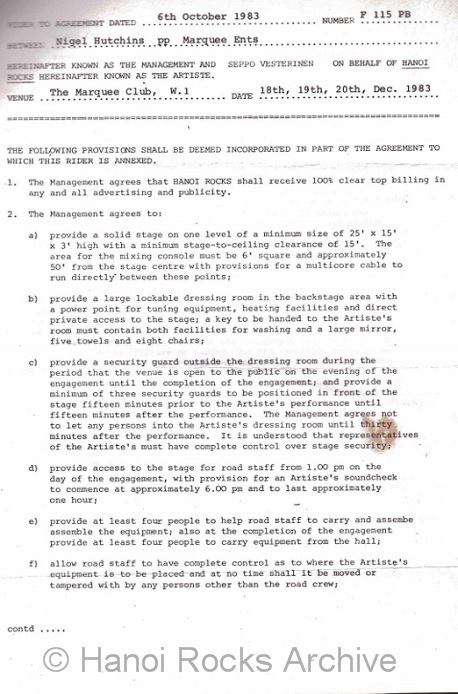 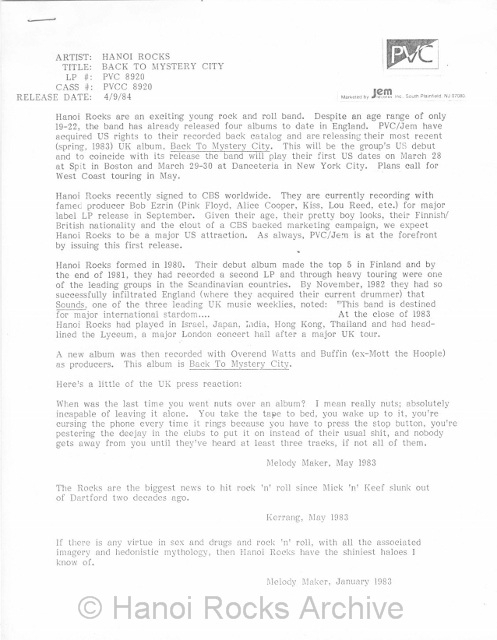 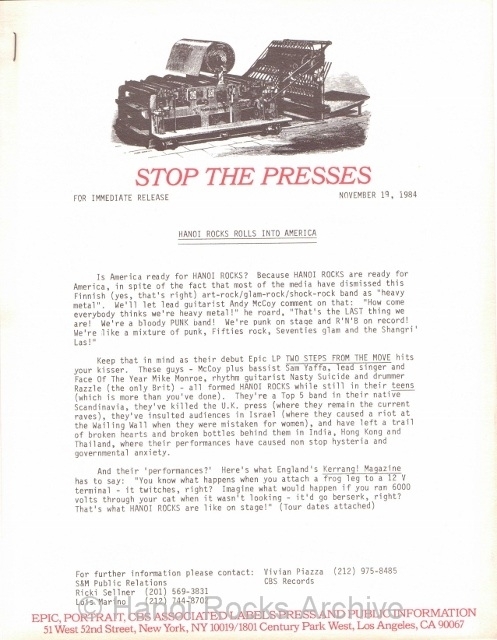 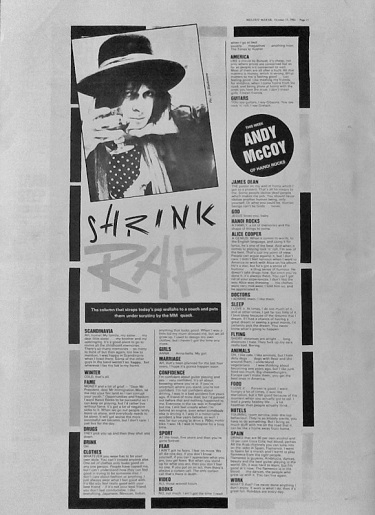 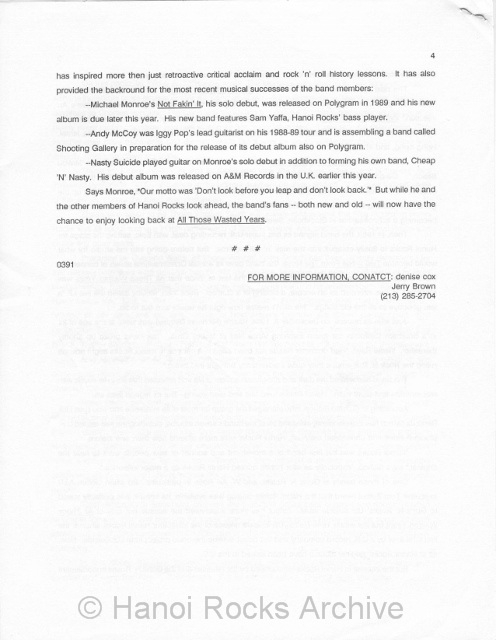 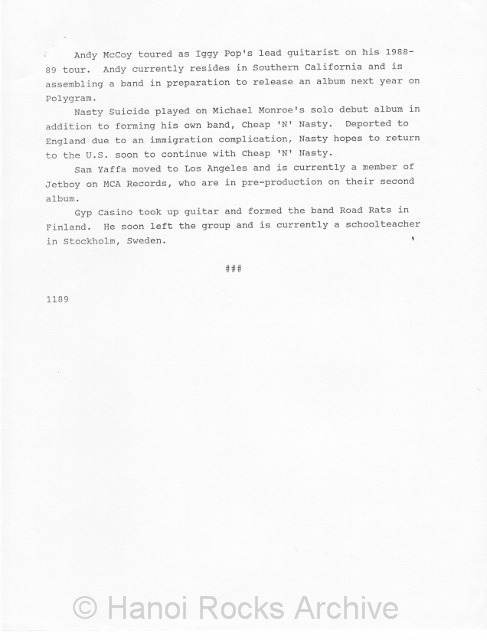 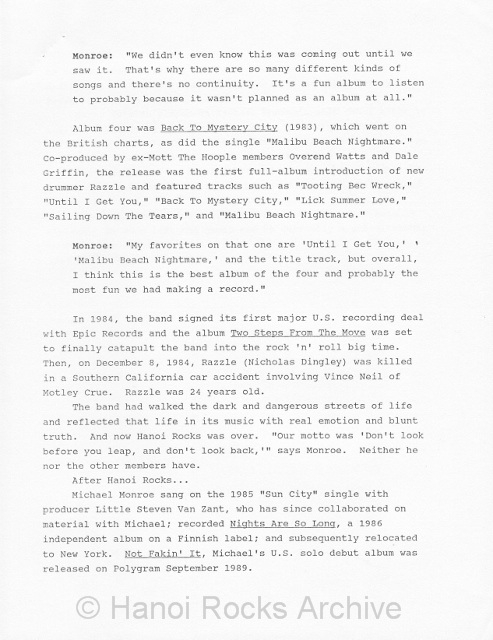 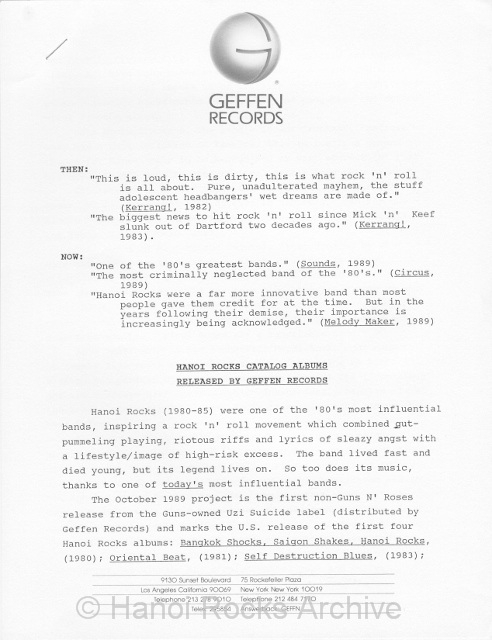 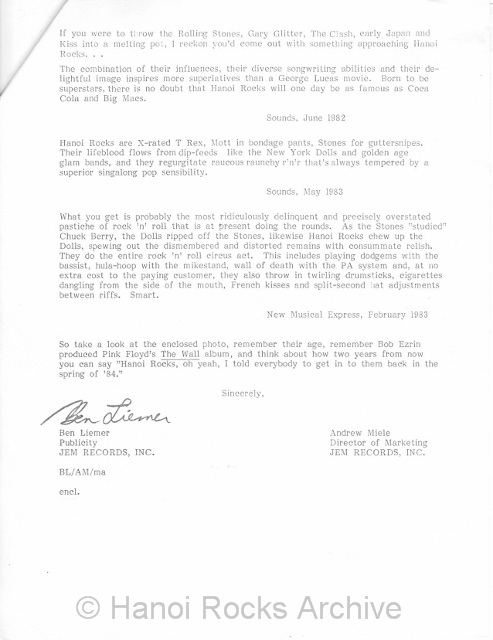 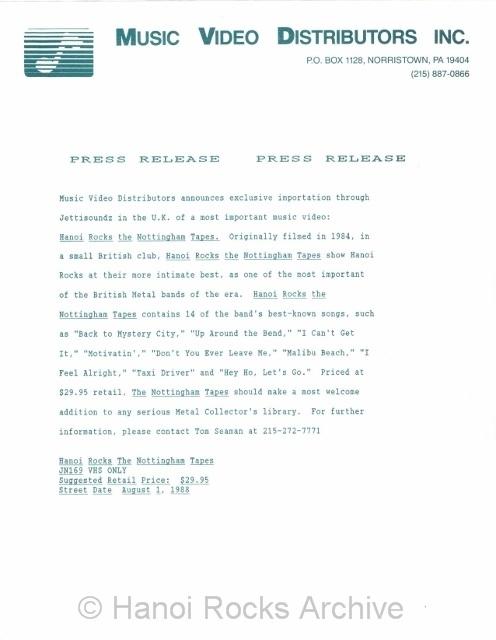 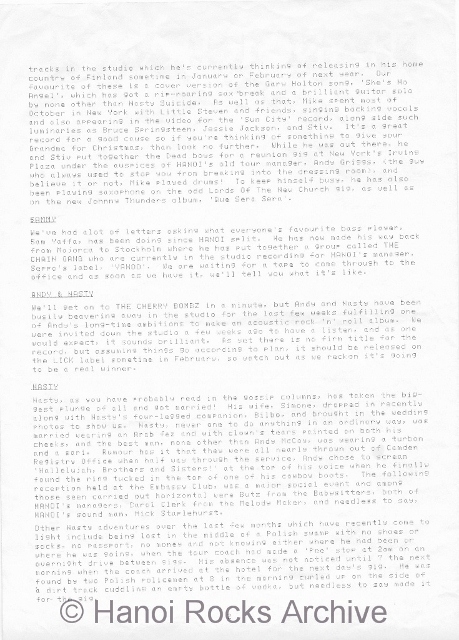 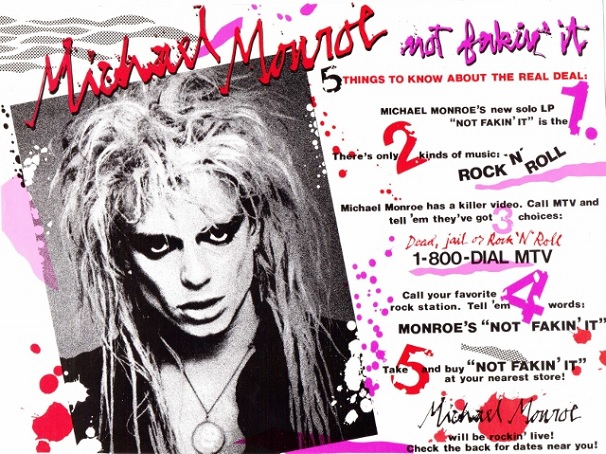 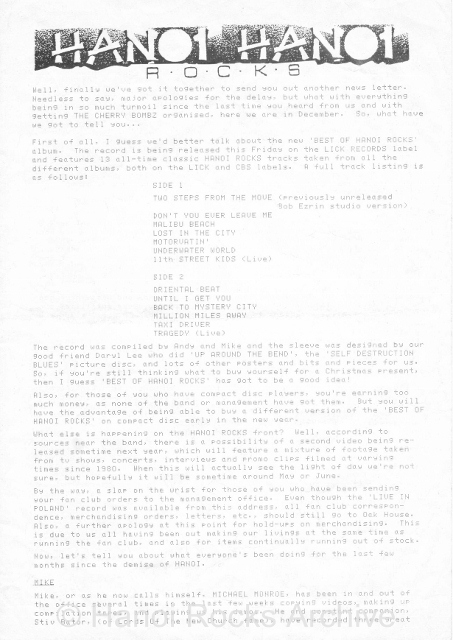 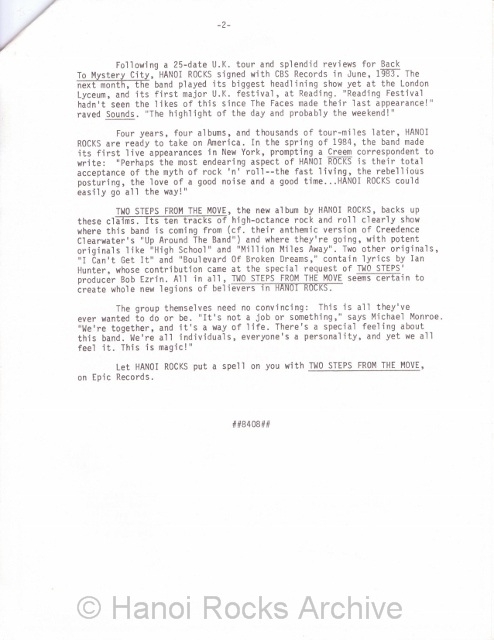 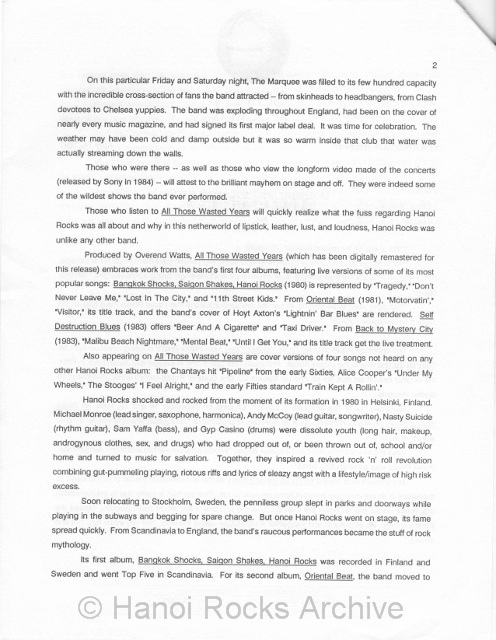 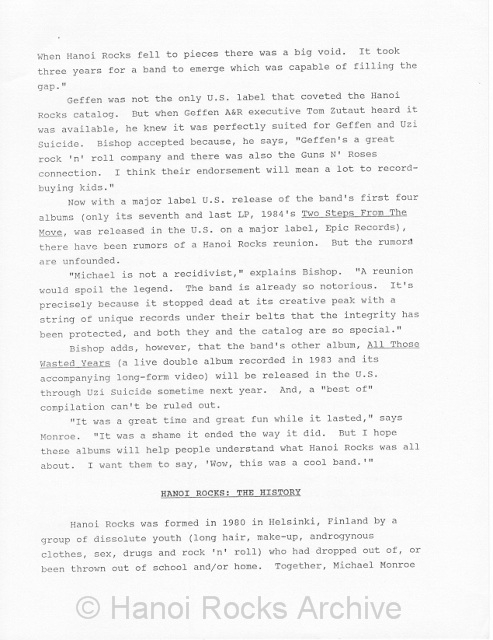 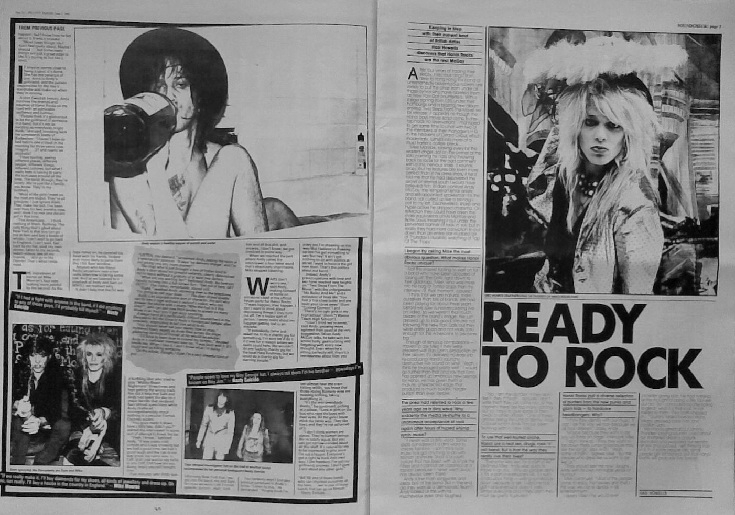 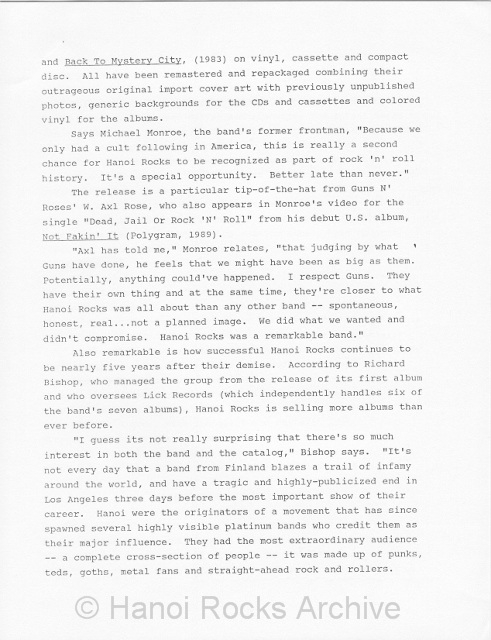 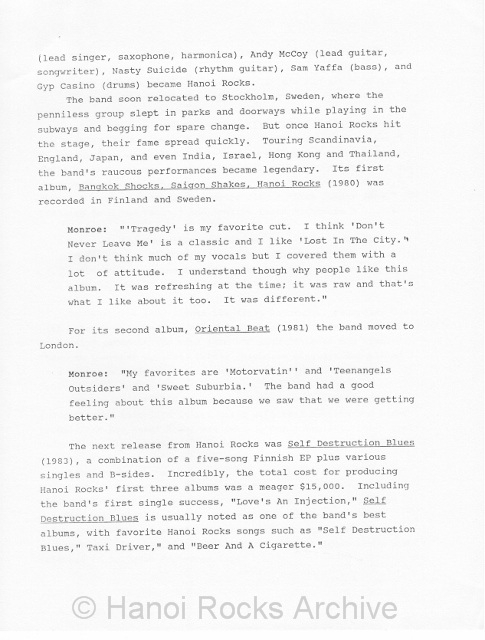 Original 1984 12-page press clipping portfolio to promote the U.S release of the "Two Steps From The Move" album and forthcoming U.S. tour. 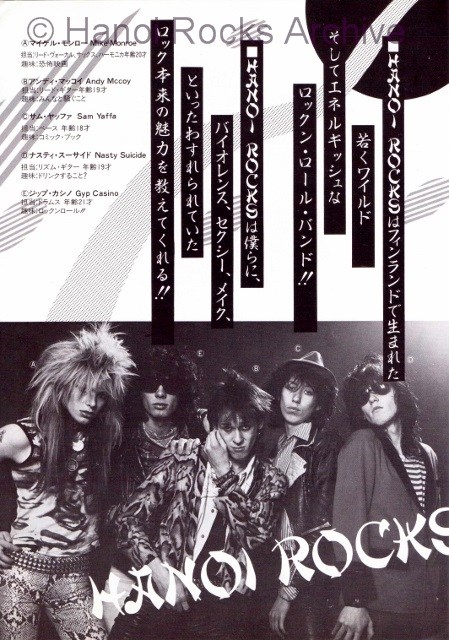 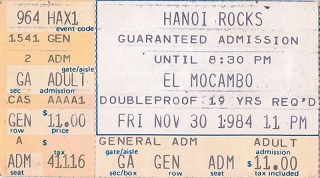 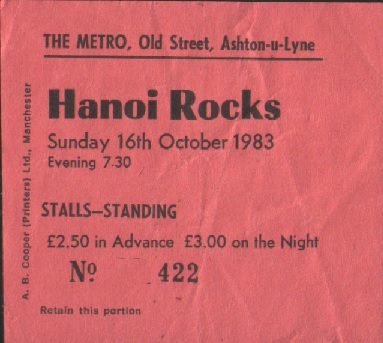 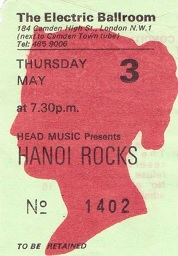 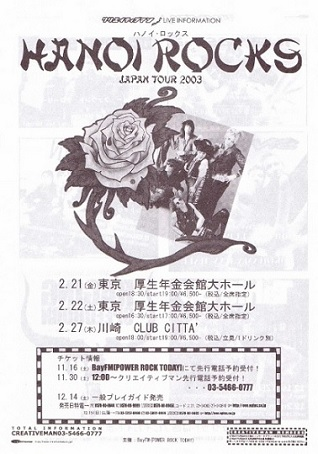 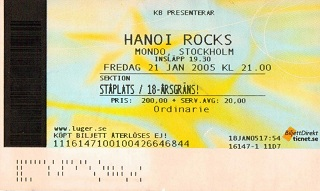 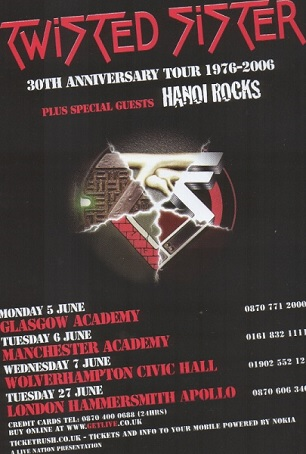 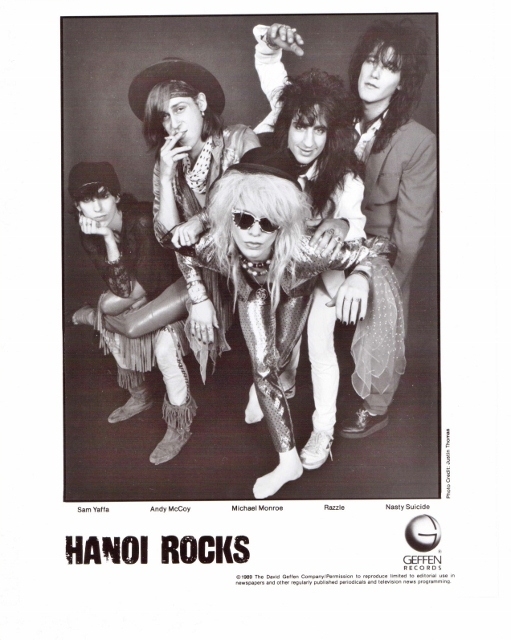 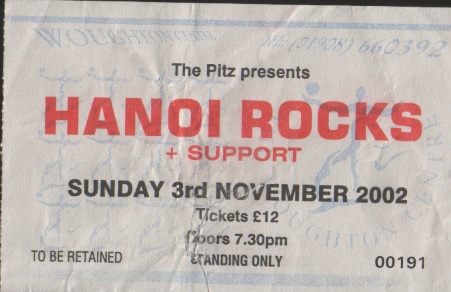 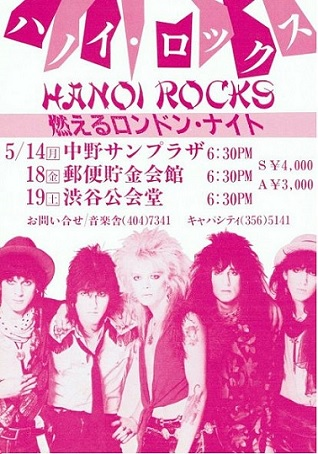 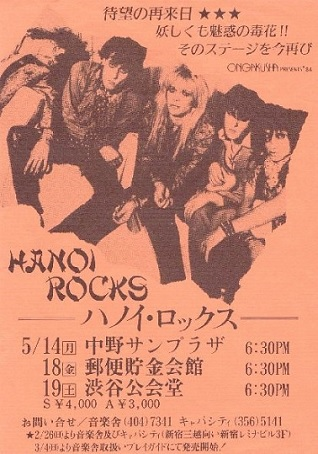 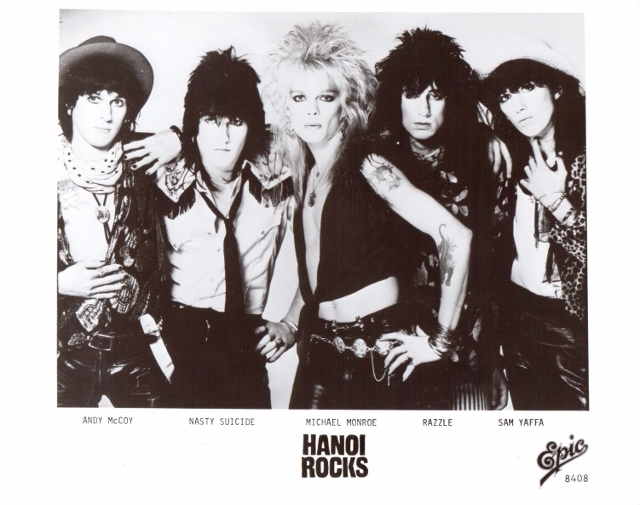 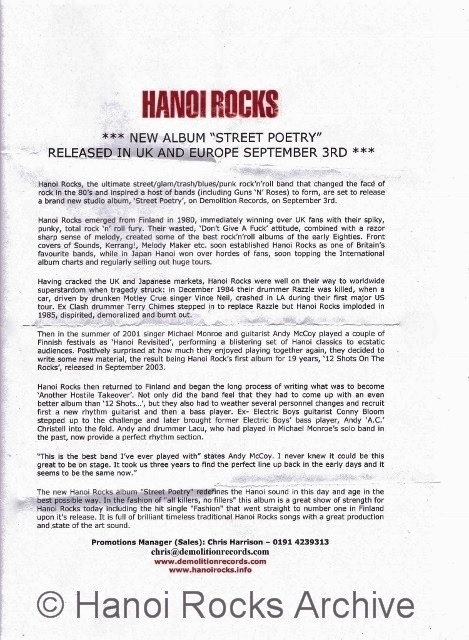 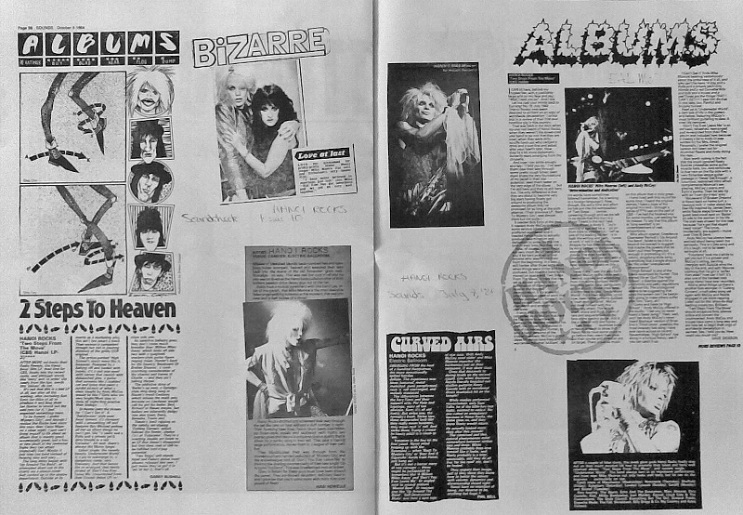 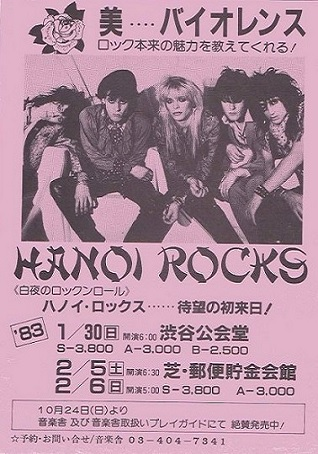 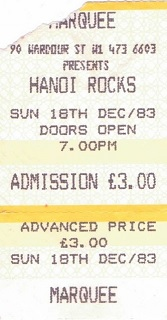 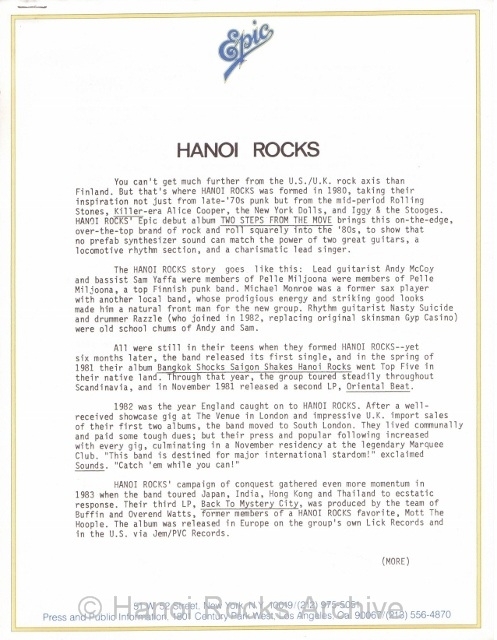 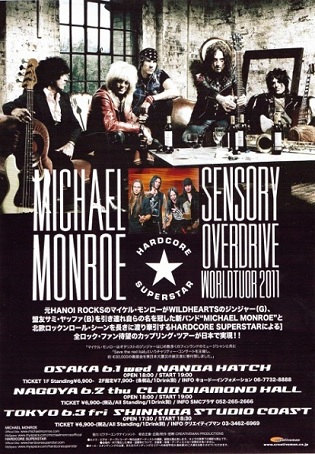 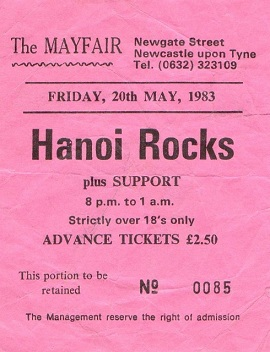 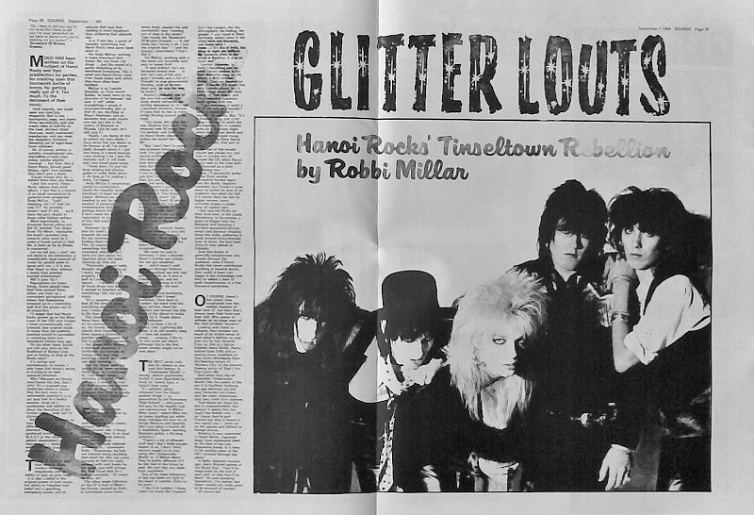 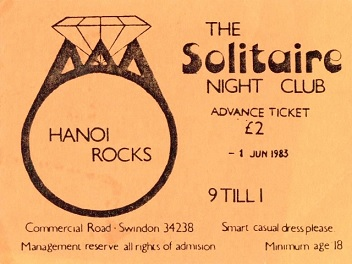 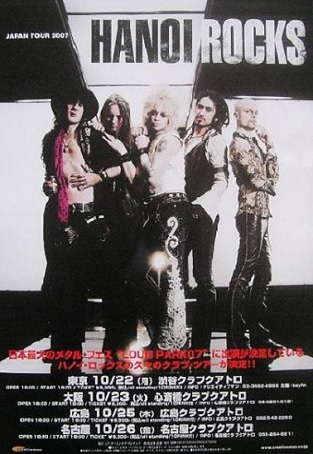 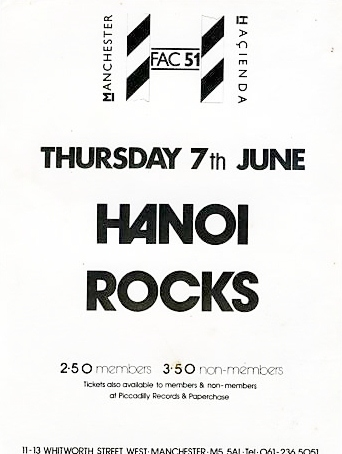 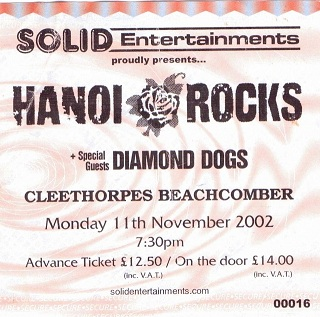 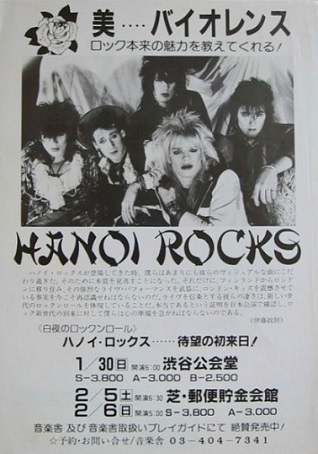 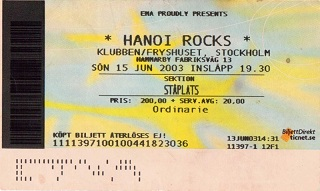 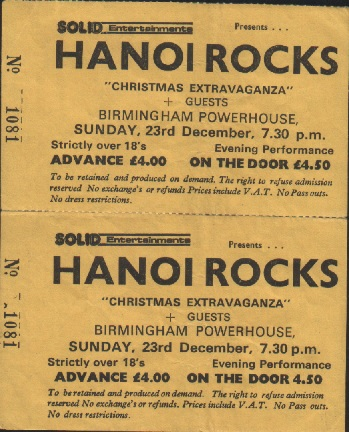 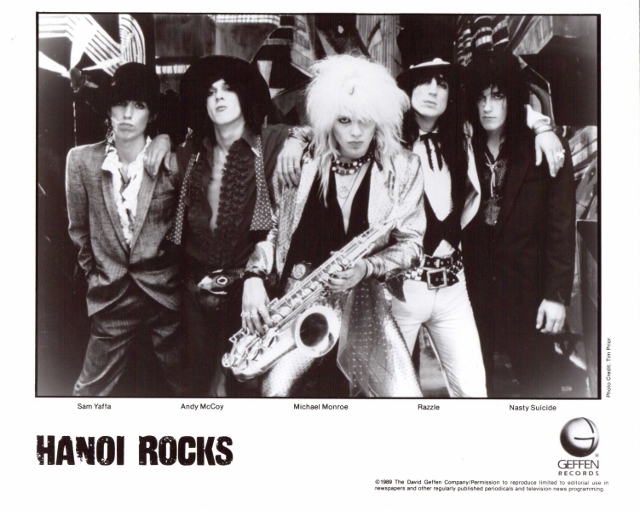 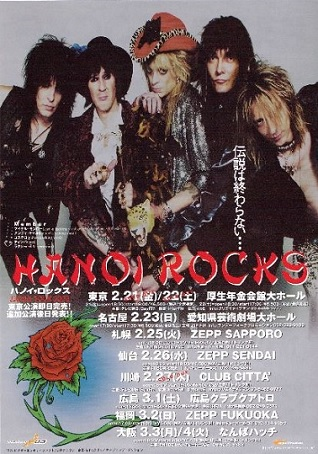 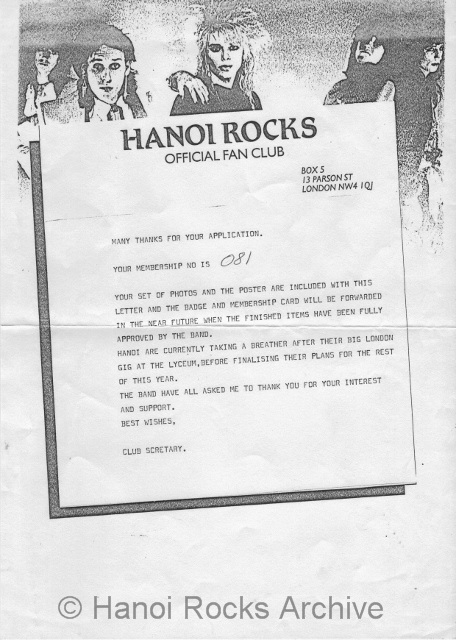 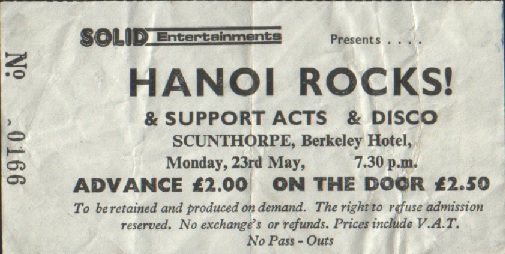 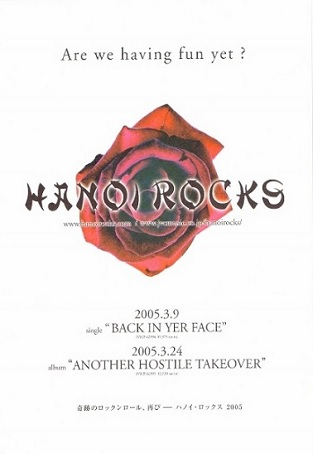 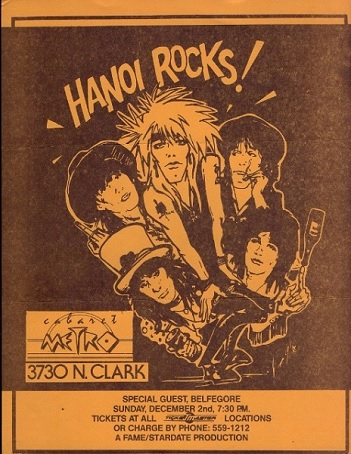 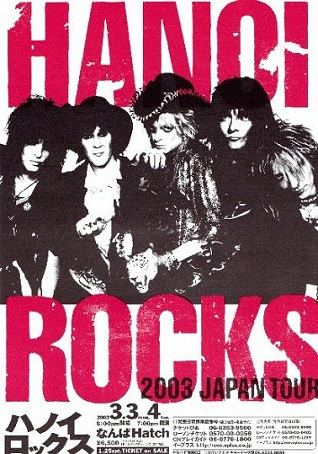 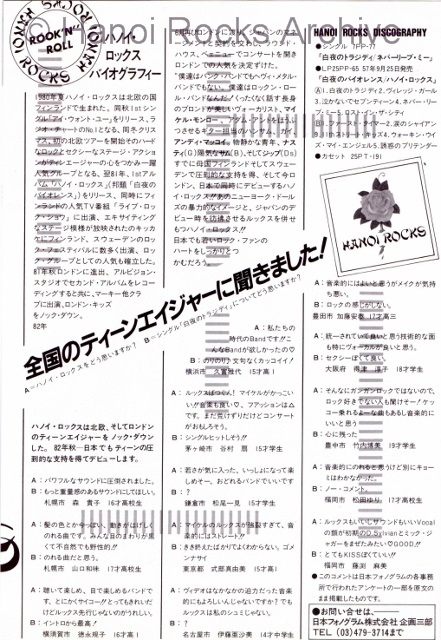 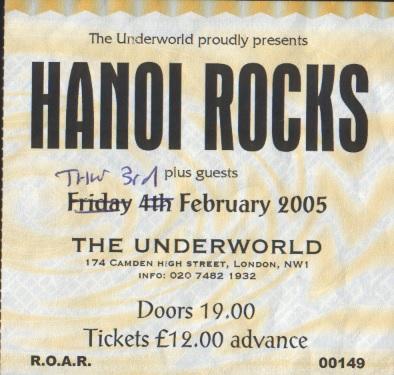 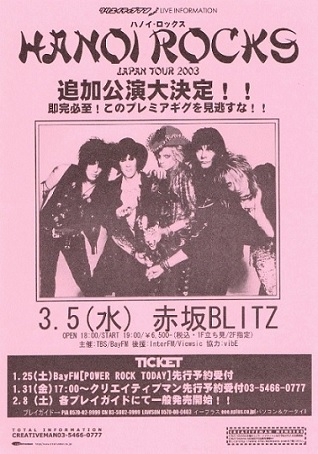 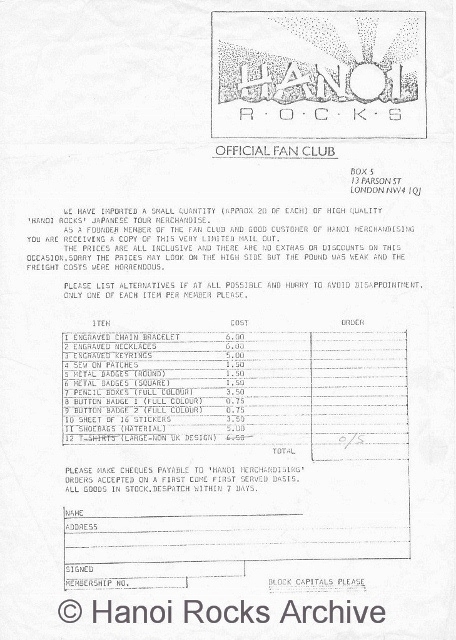 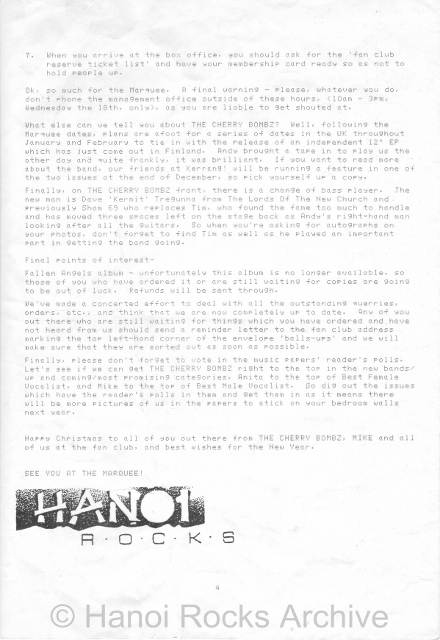 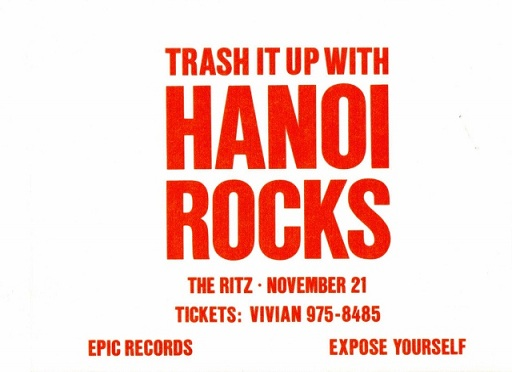 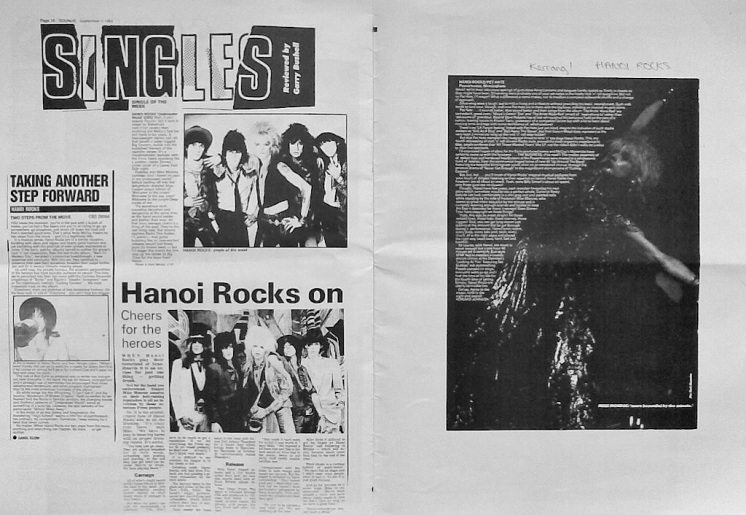 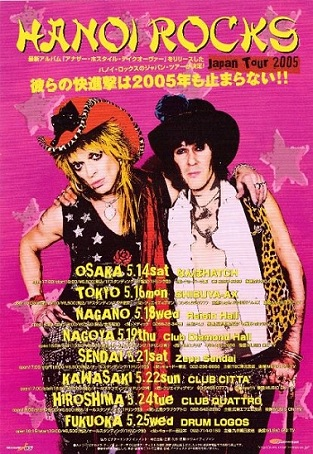 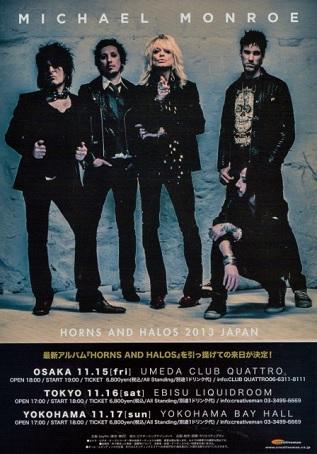 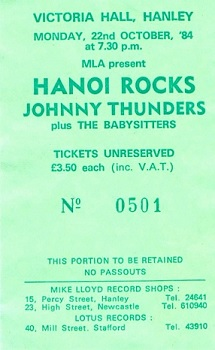 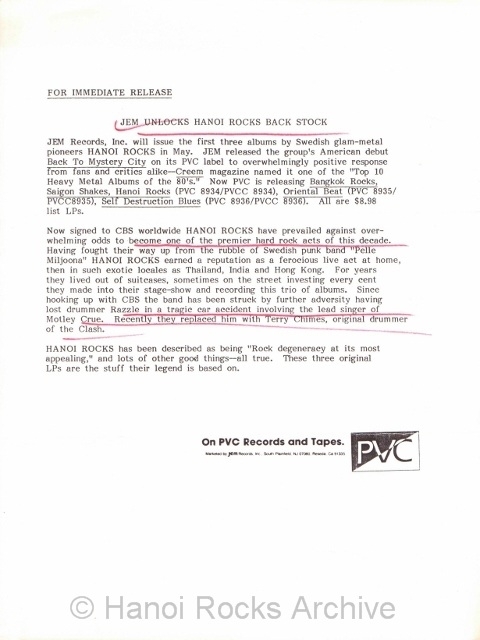 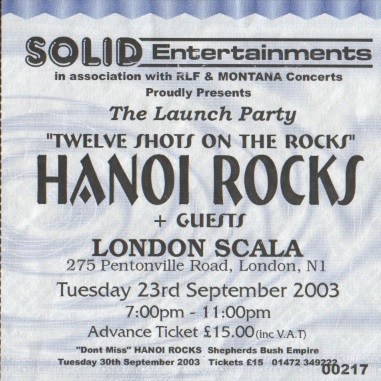 Original 1982 4-page Japanese promotional leaflet for the release of Hanoi Rocks 1st album "Bangkok Shocks,Saigon Shakes,Hanoi Rocks"
Tour itineraries were given to members of the band and the crew.Each itinerary includes detailed descriptions of the tour.Only 20-25 itineraries would be printed for a tour. 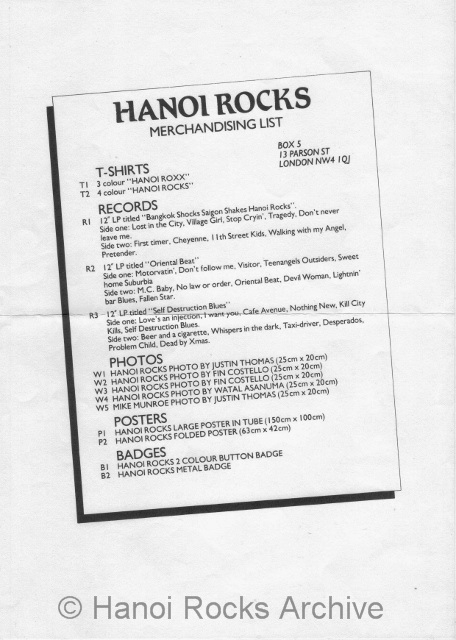 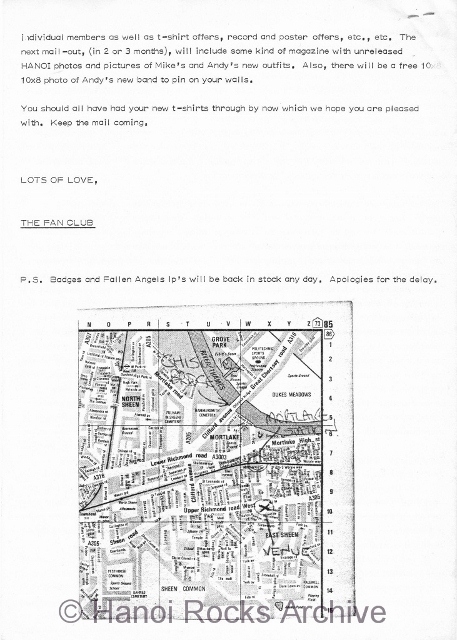 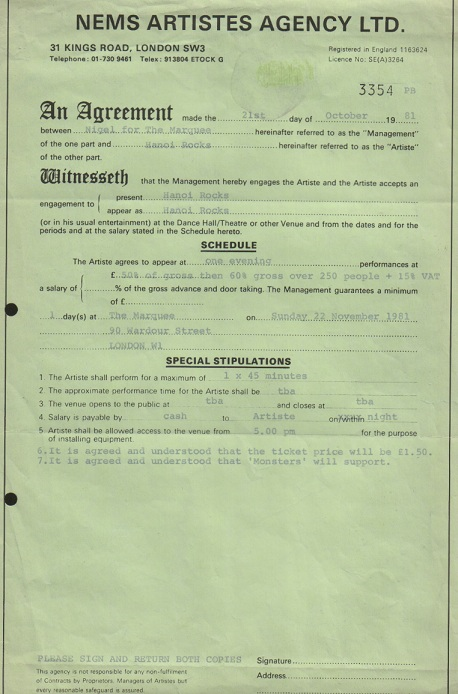 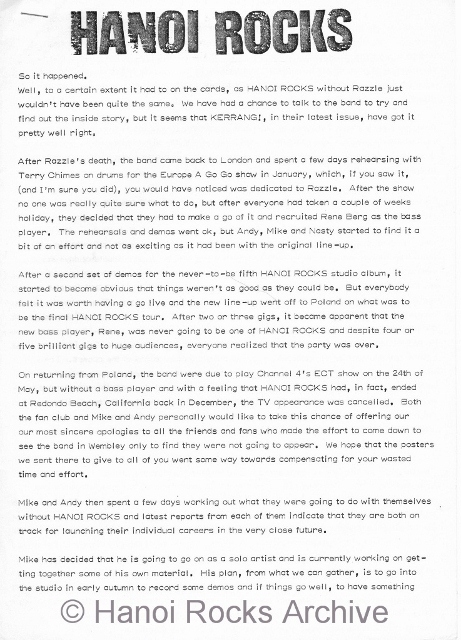 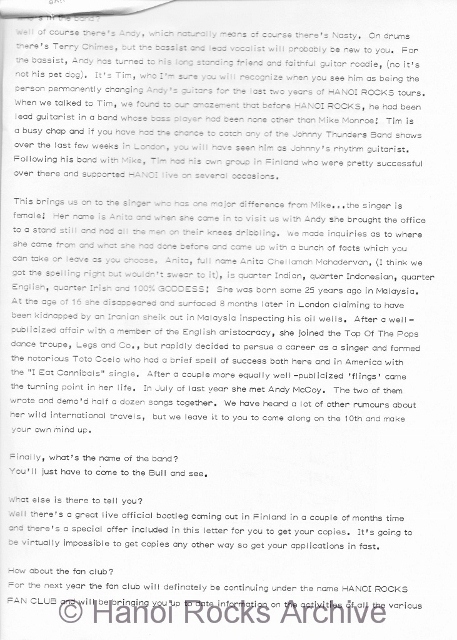 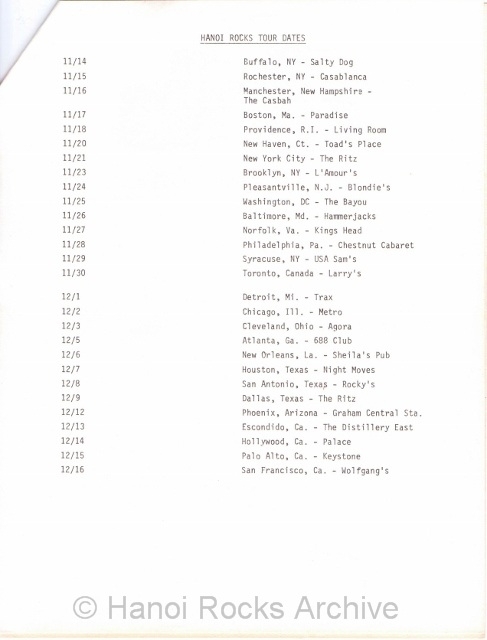 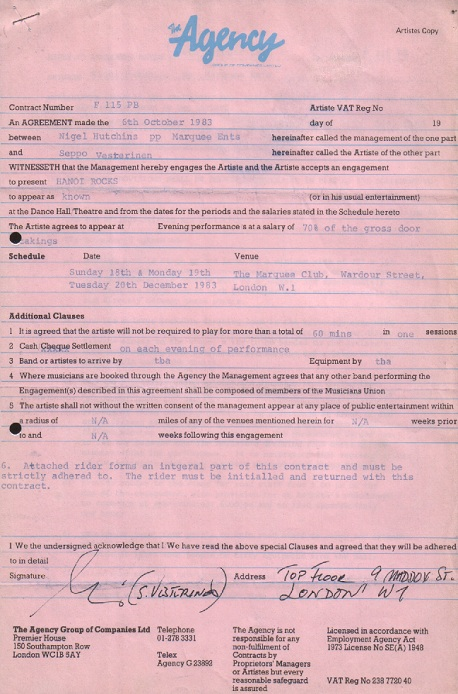 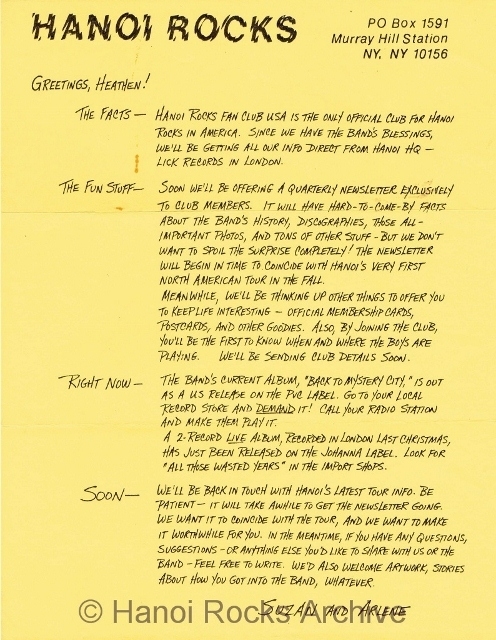 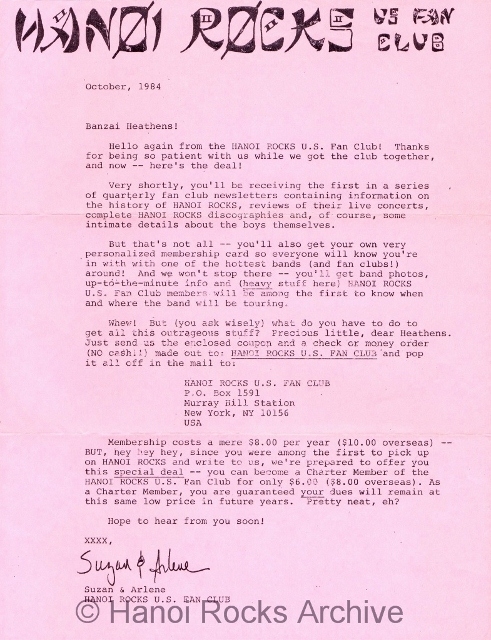 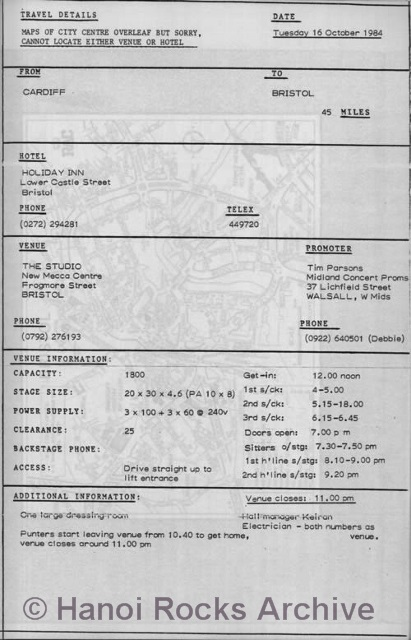 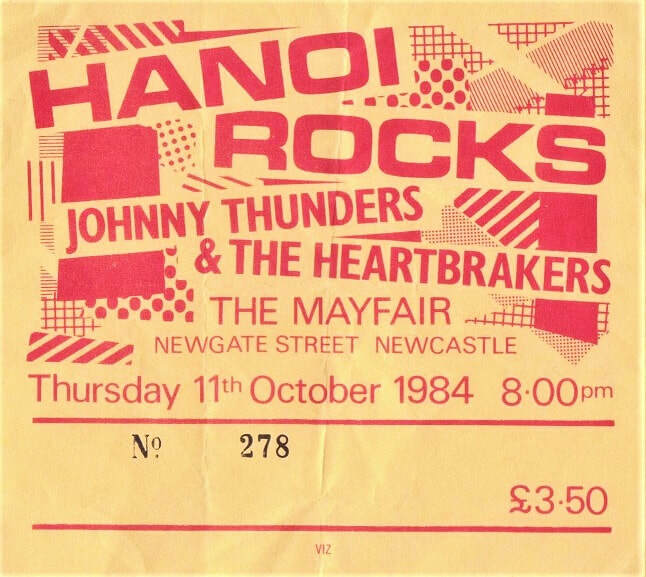 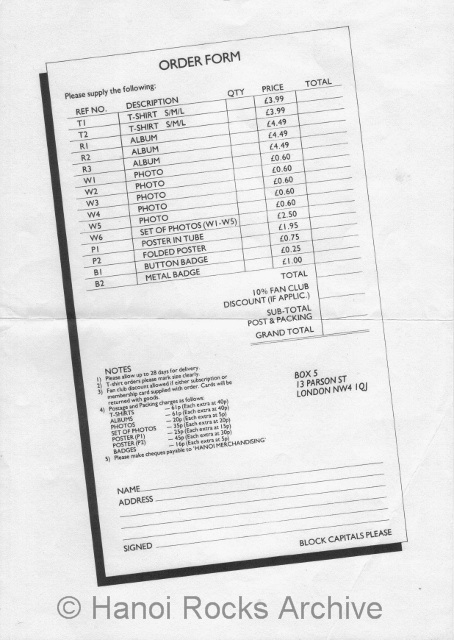 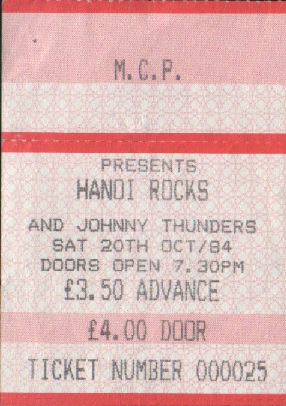 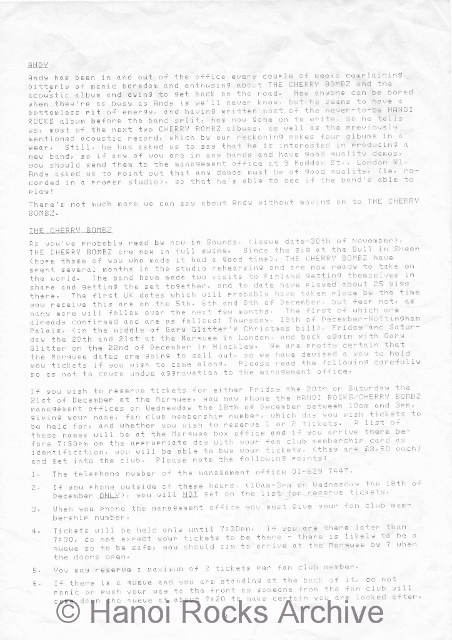 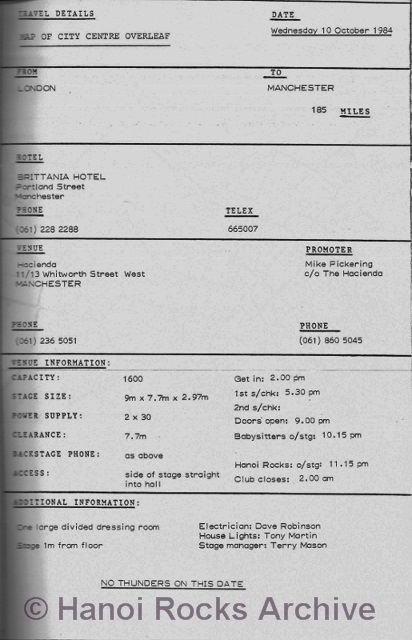 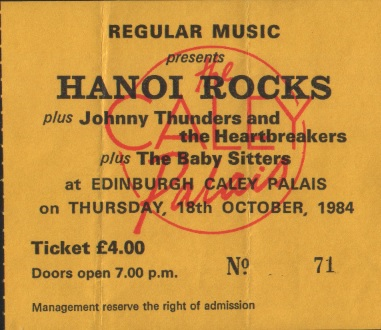 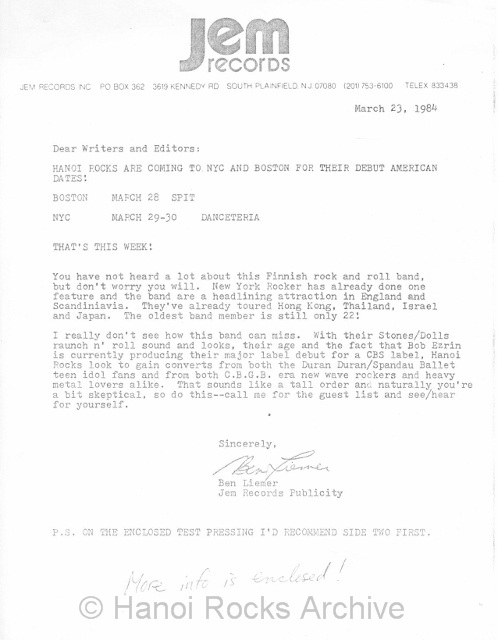 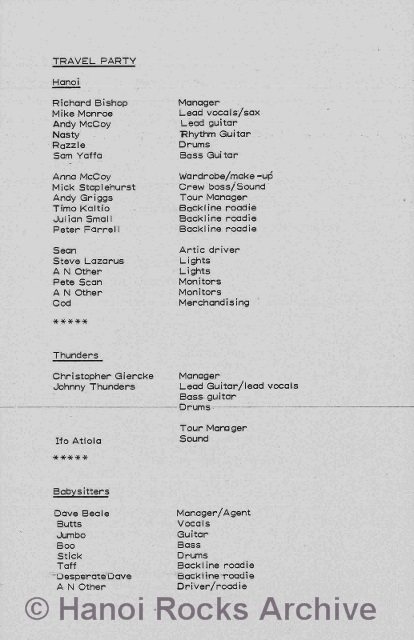 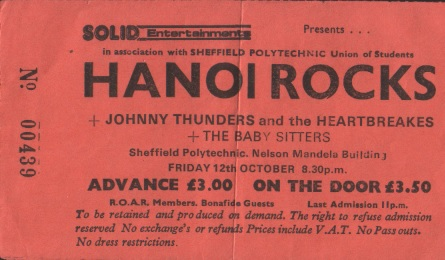 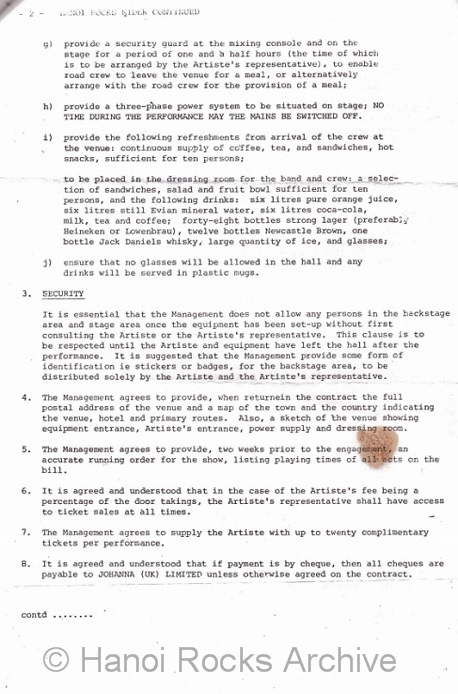 This is an original tour itinerary for the Hanoi Rocks & Johnny Thunders October 1984 U.K. tour.38 pages detailing tour dates,tour personnel,venue information,maps,hotel information.This is a selection of four pages from the itinerary. 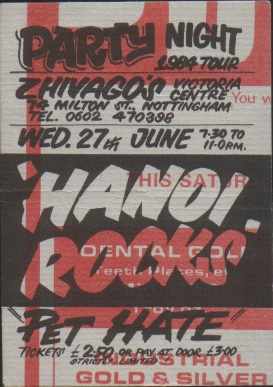 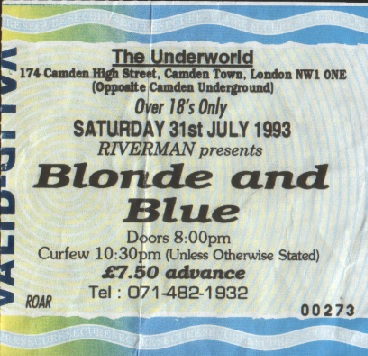 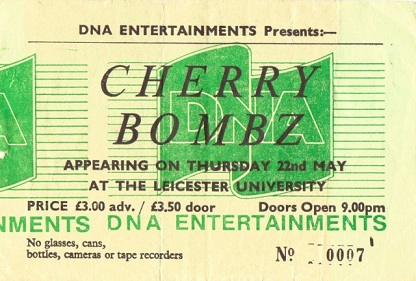 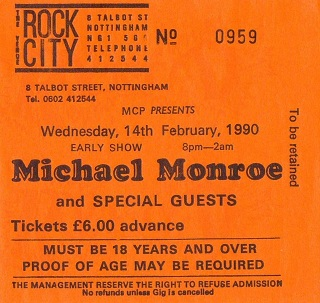 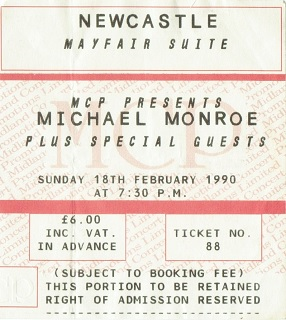 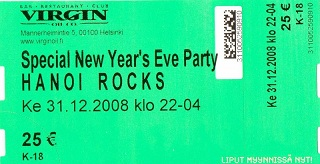 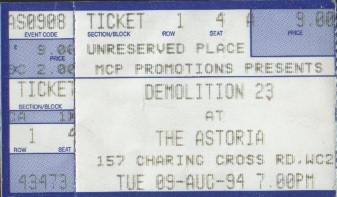 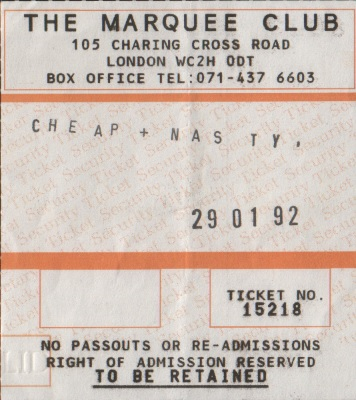 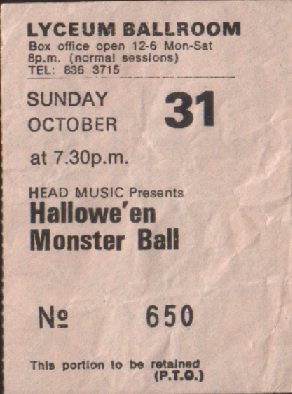 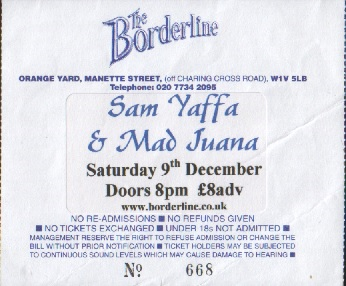 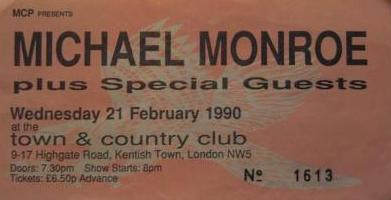 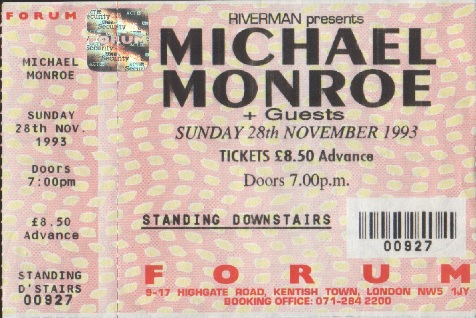 Ticket Stubs from 1982 to the present day. 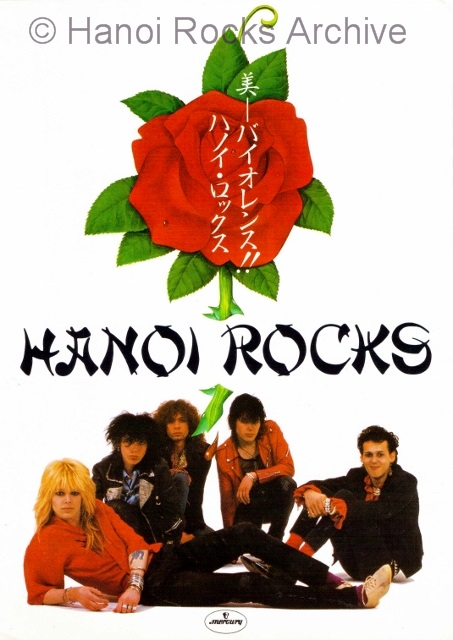 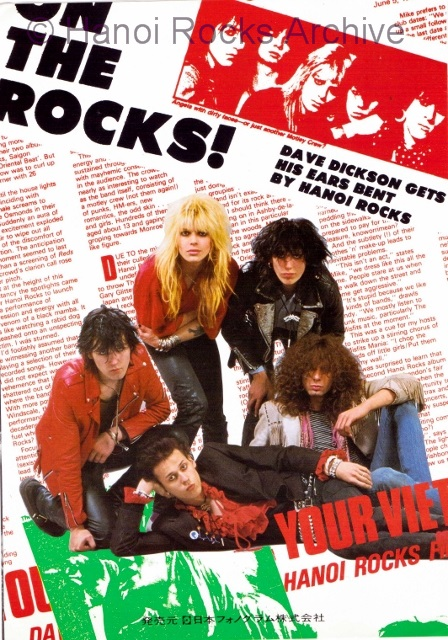 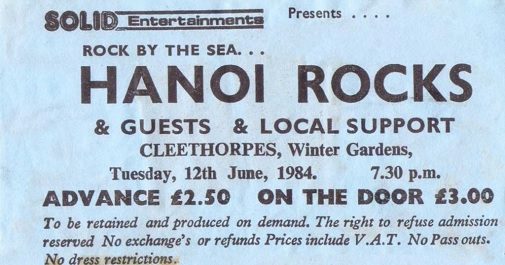 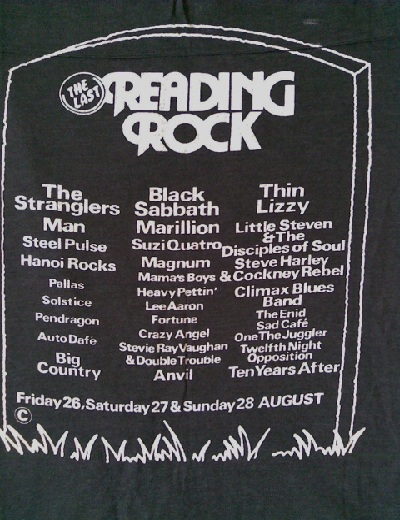 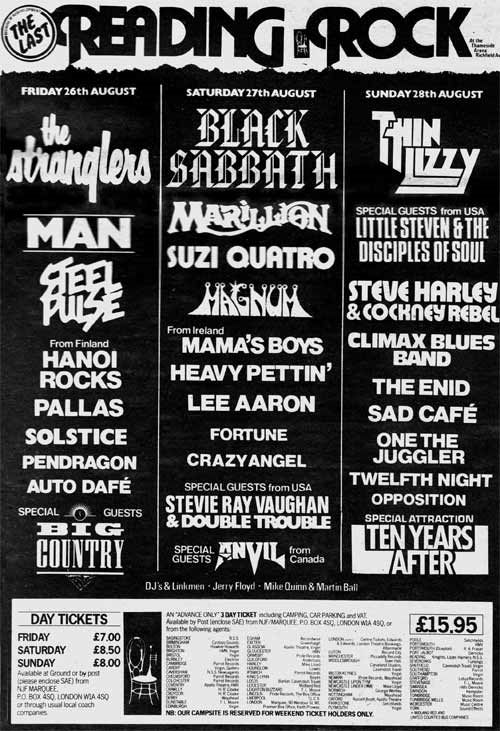 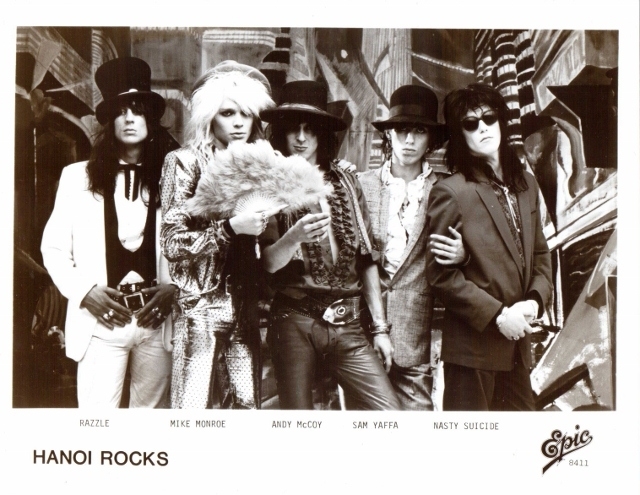 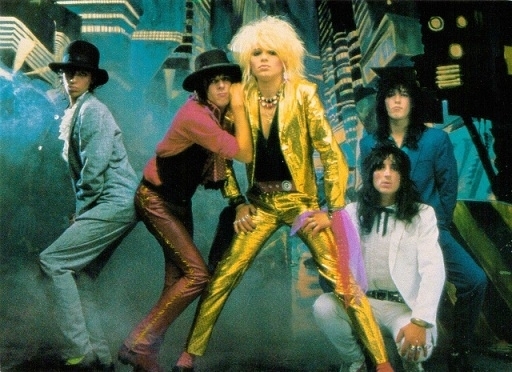 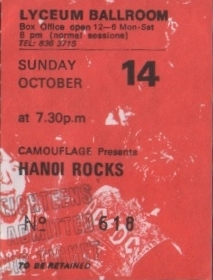 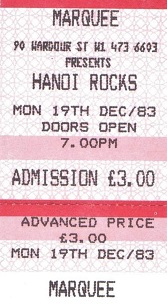 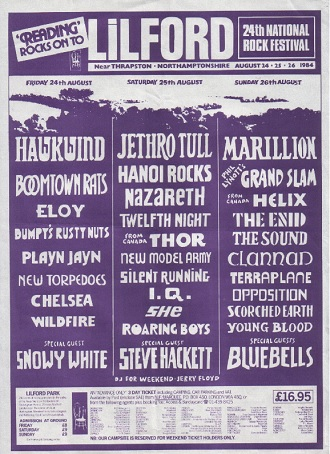 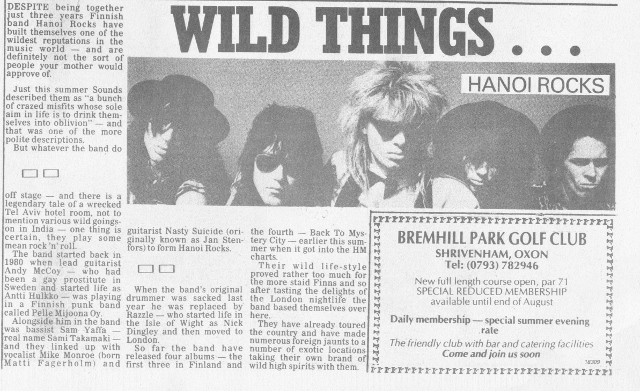 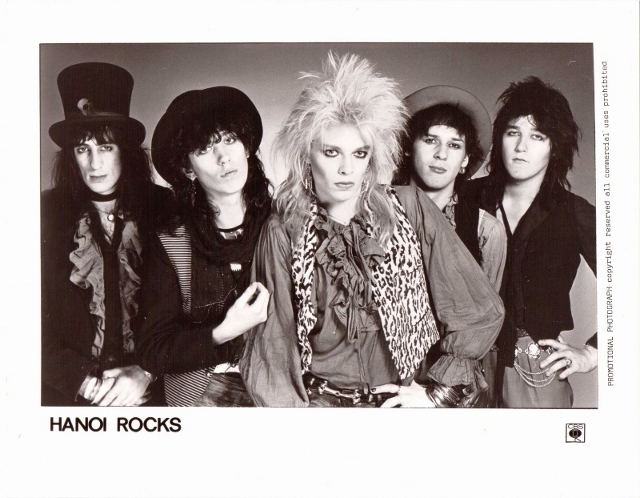 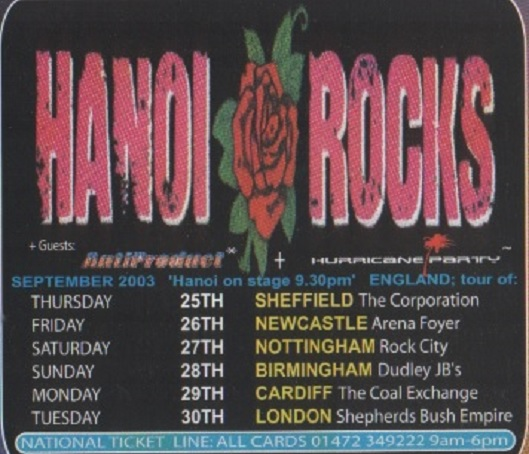 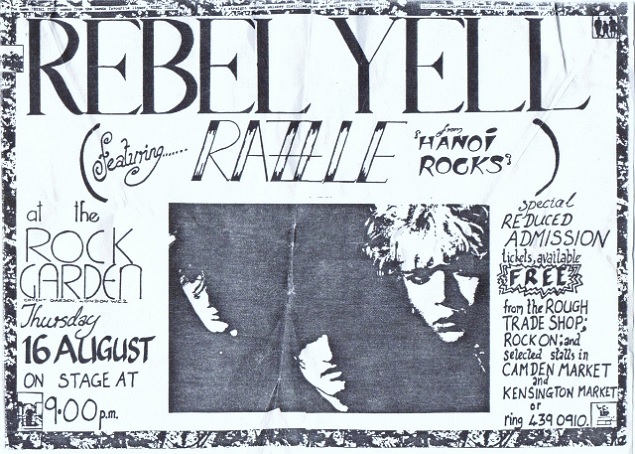 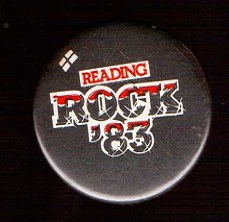 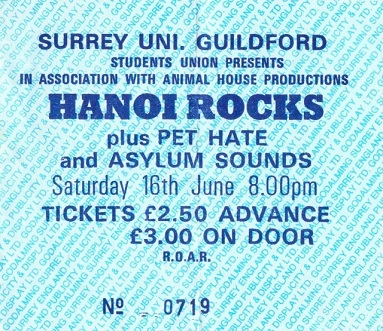 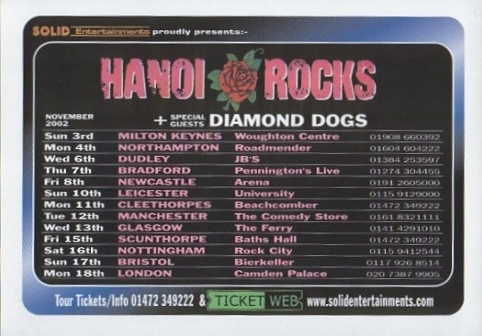 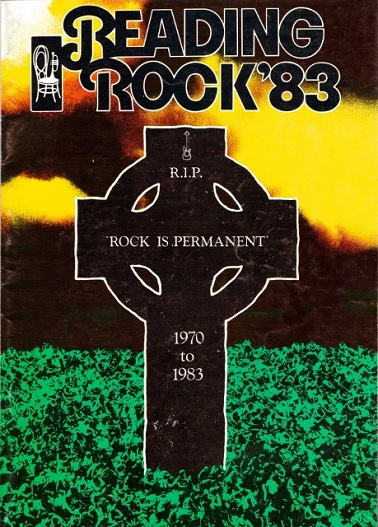 On August 26th 1983 Hanoi Rocks played at the Reading Rock Festival in Berkshire,England.Lining up along side legendary bands Black Sabbath and Thin Lizzy. 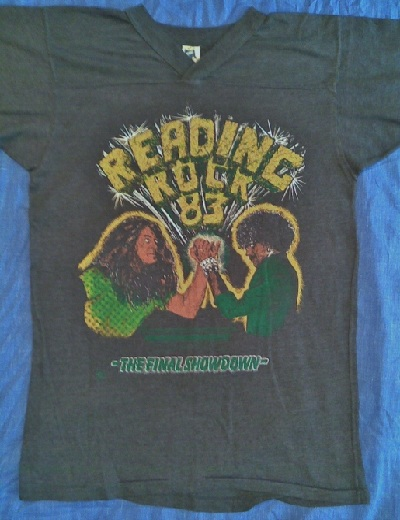 This is a gallery of official merchandise from the festival. 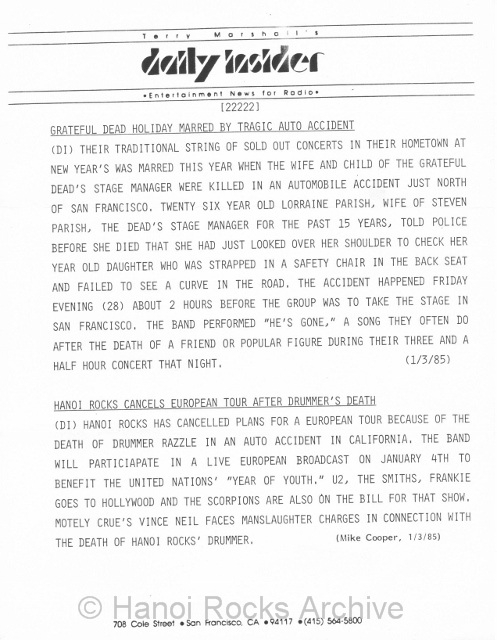 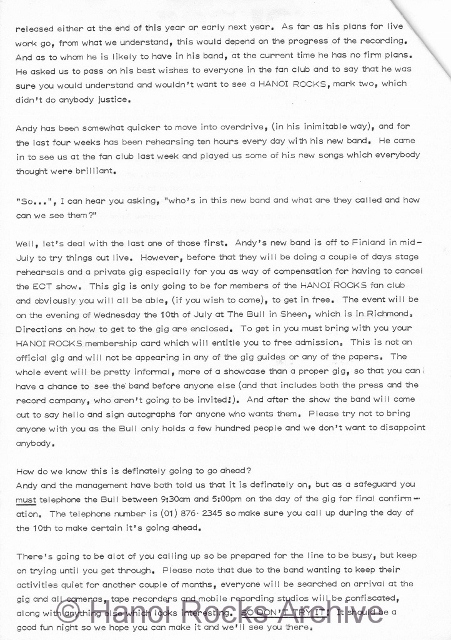 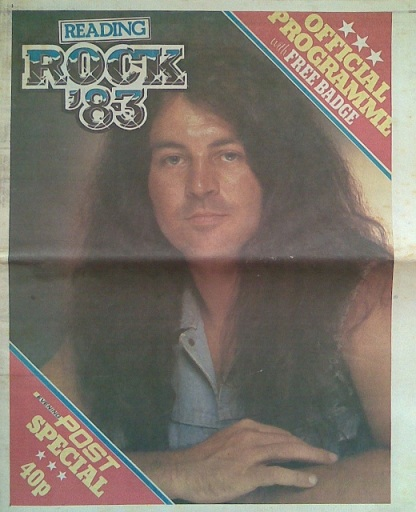 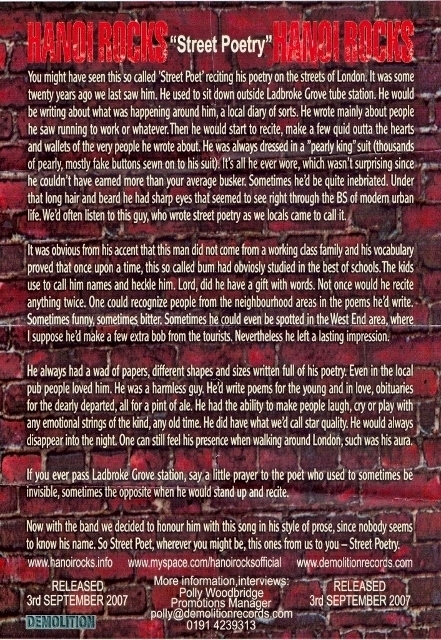 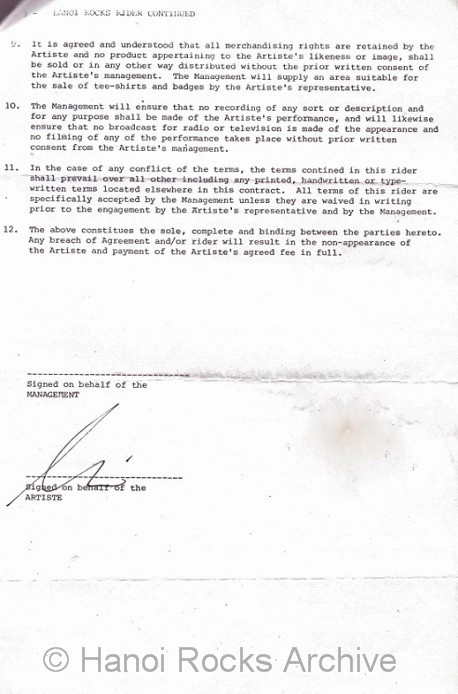 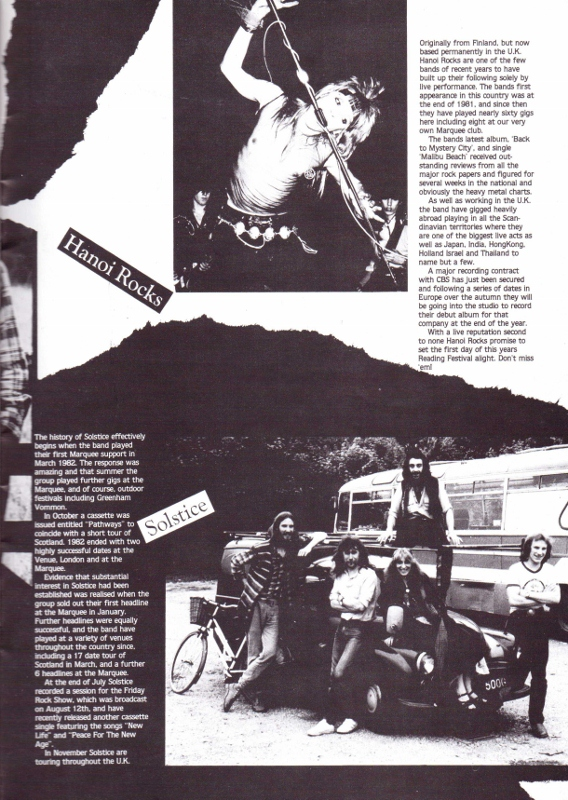 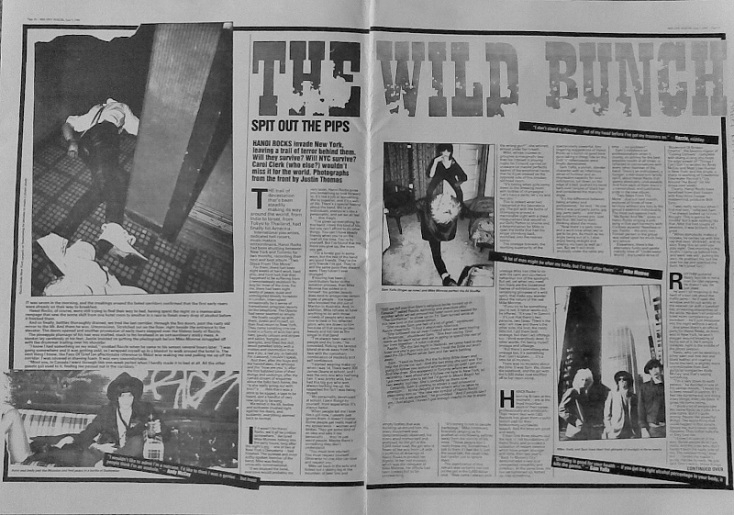 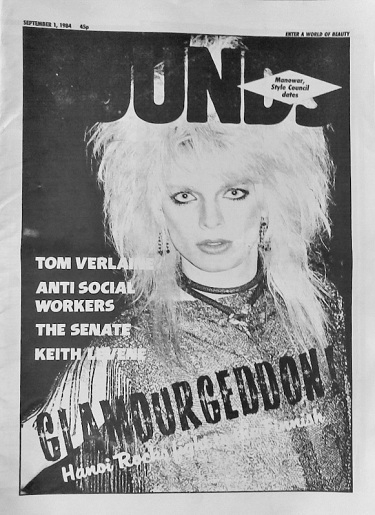 Gig adverts from music press,magazines & newspapers around the world. 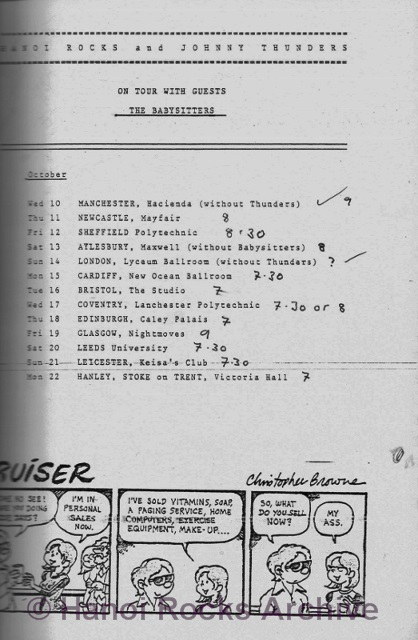 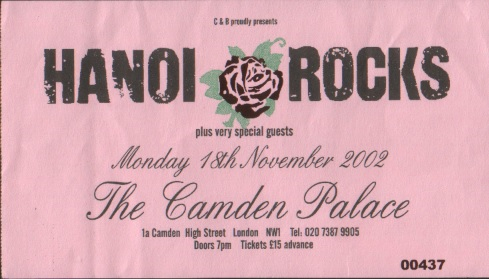 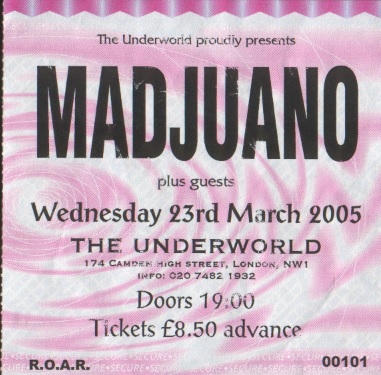 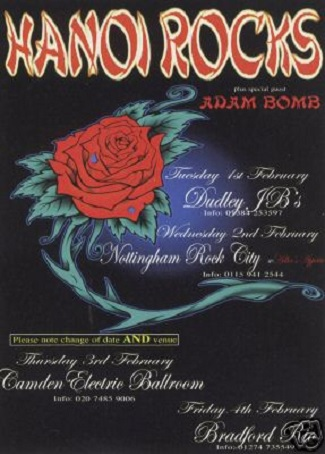 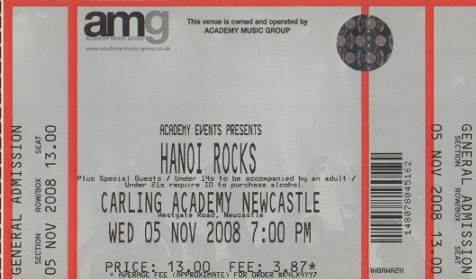 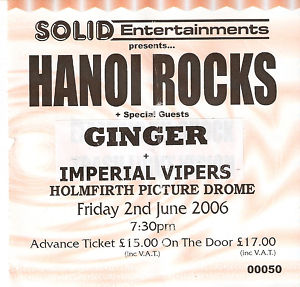 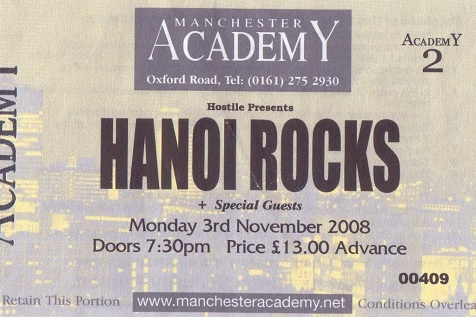 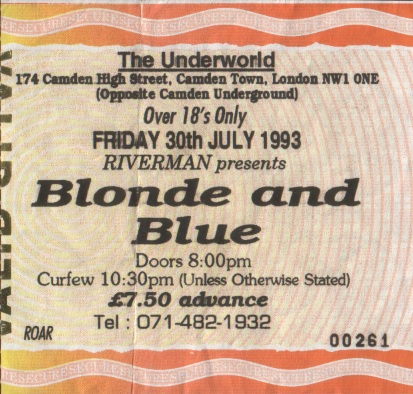 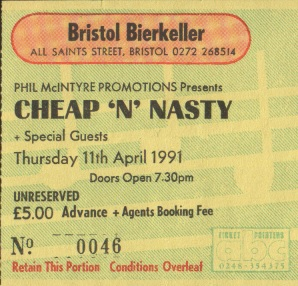 Adverts for U.K. gigs can be looked at on the "U.K Gig History" page,there's 100+ adverts to look at. 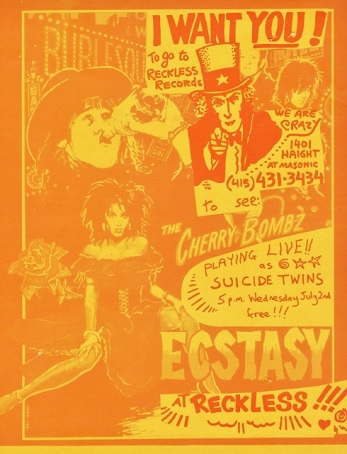 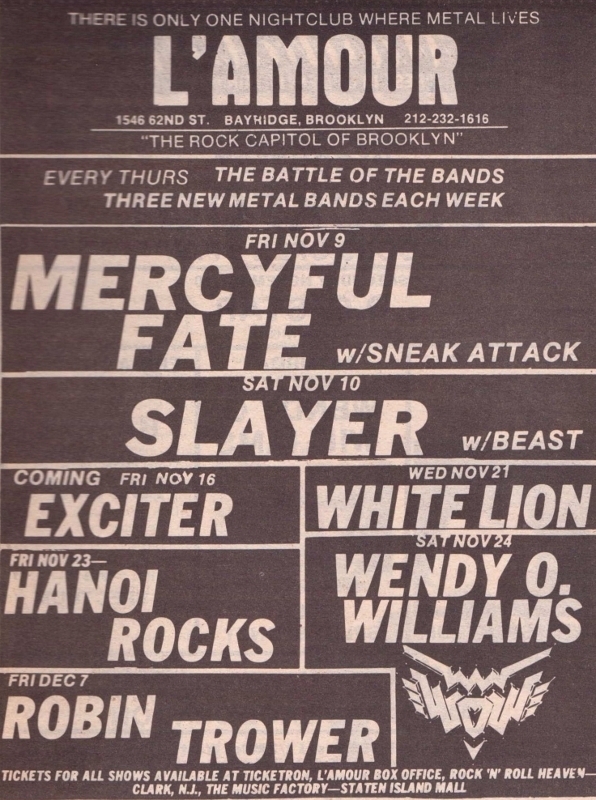 Gig Adverts for the gig at the New York Ritz 21/11/84. 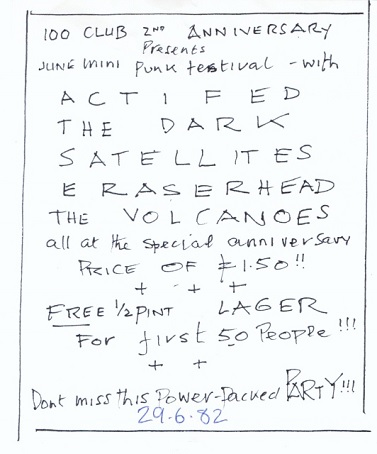 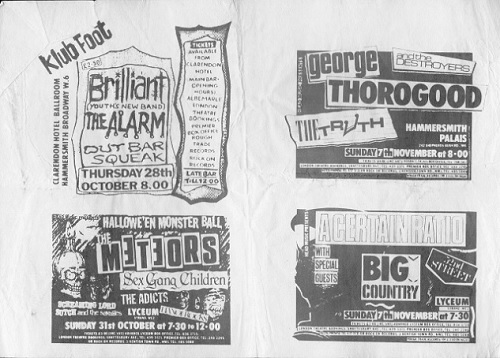 Gig Advert for the gig at Brooklyn L'Amour 23/11/84 from 'Aquarian Weekly' magazine. 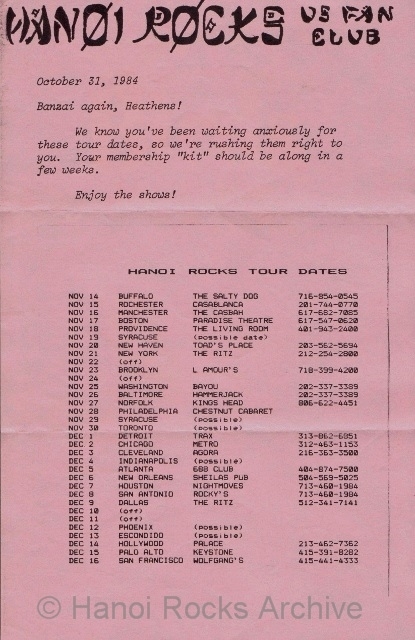 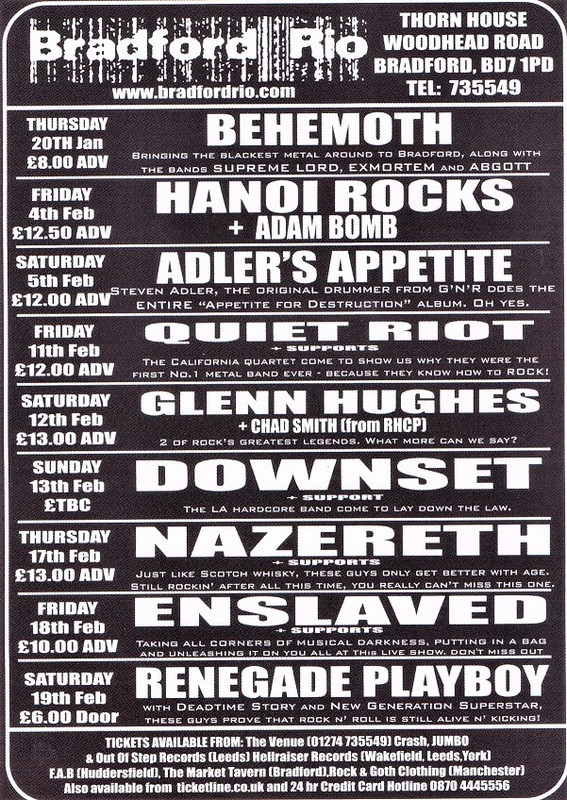 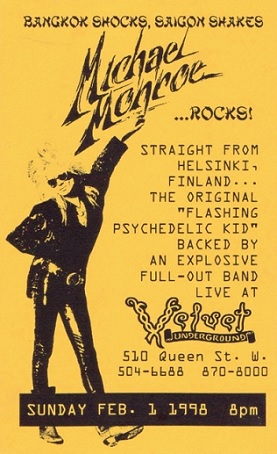 Gig Advert for the gig at Cleveland Peabody's Downunder 3/12/84 from 'Cleveland Scene' Magazine. 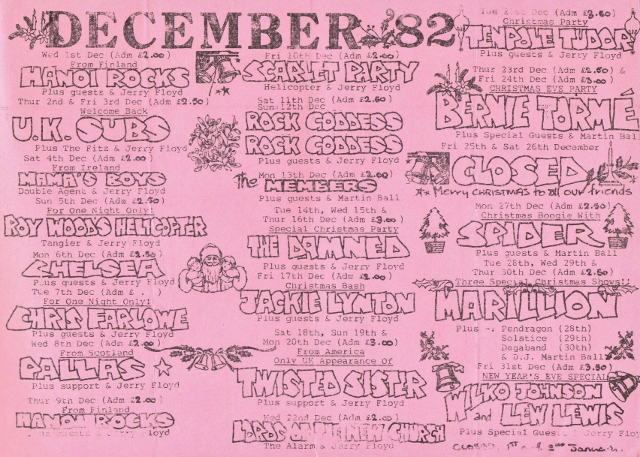 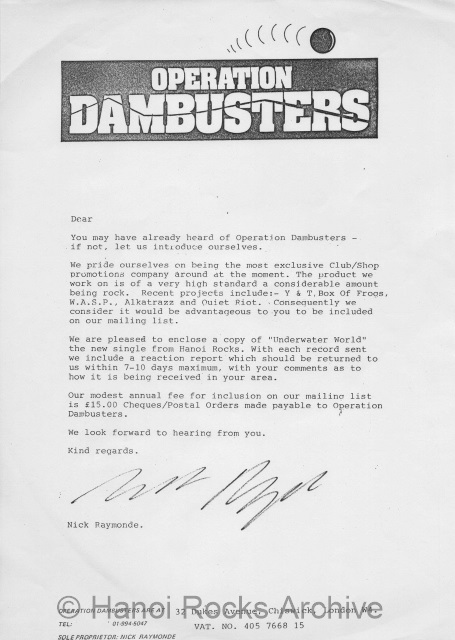 Gig advert for the cancelled gig at the Los Angeles Palace 14/12/84 from 'Bam' magazine.Tickets for the gig had sold out in under half an hour. 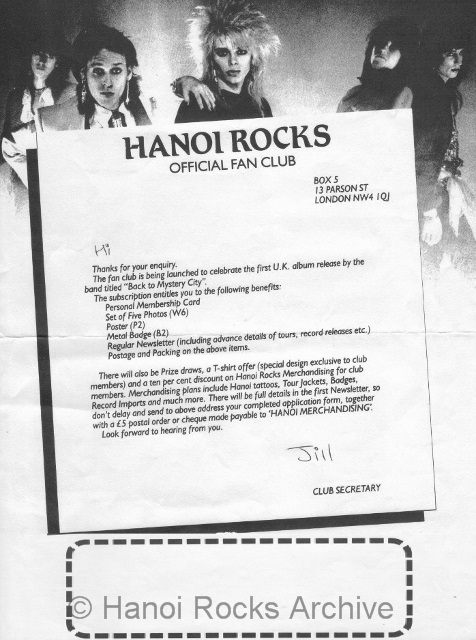 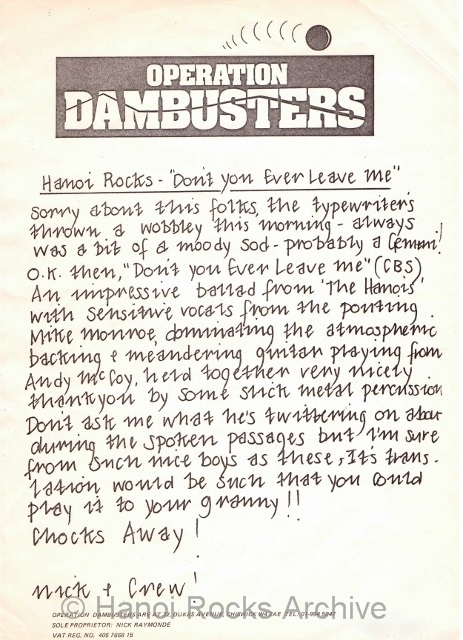 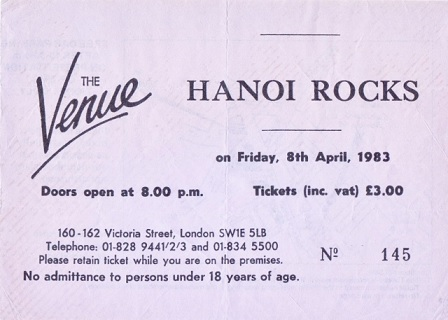 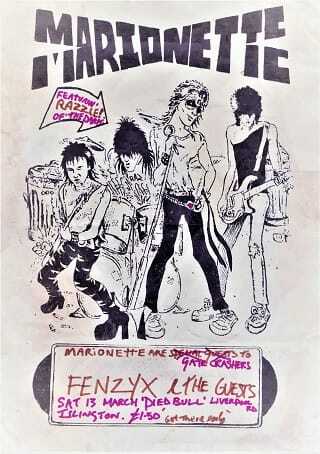 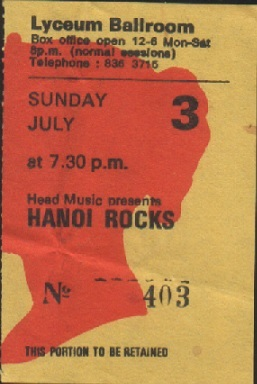 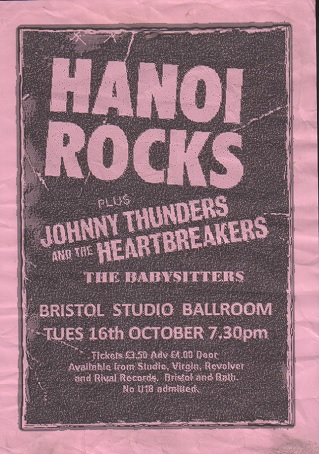 Hanoi Rocks Valentine Concert Leaflet From Thailand for the Gig @Bangkok TC Hall 14th February 1983.